Erected by Wm. SOMMERVILLE, in memory of his son Gilbert who died at Garryhorn 20th July 1863 aged 6 months. Also James SLOSS, his brother in law who died at Garryhorn 4th Sept 1864 aged 49 years. Also Mary SLOSS wife of the above Wm. 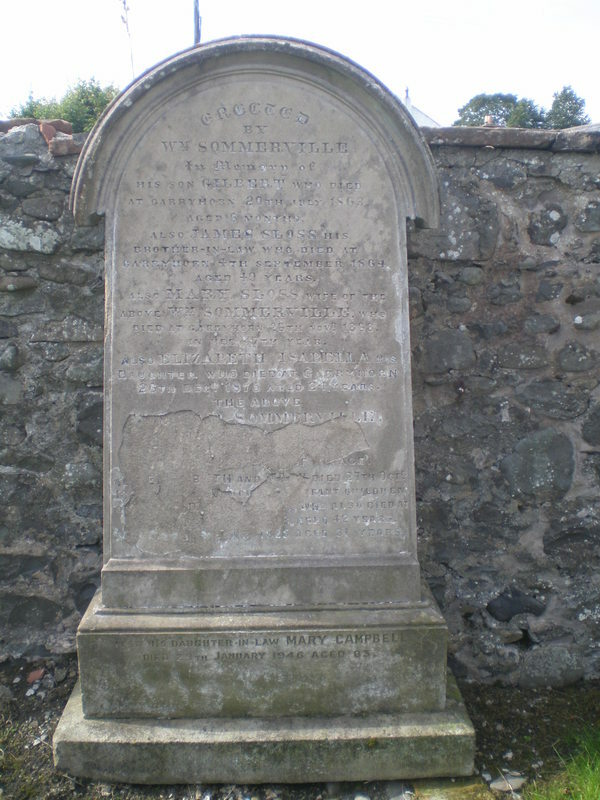 SOMMERVILLE who died at Garryhorn 26th Nov. 1868 in her 47th year. Also Elizabeth Isabella, his daughter who died at Garryhorn 26th Dec 1875 aged 24 years. The above William SOMMERVILLE who died at Garryhorn 4th October 1890 aged 83 years. Also Elizabeth and Mary died at Garryhorn 27th Oct 1894 and 4th March 1895, Infant children of David Welsh who also died at Victoria Infirmary Glasgow 25th July 1898 aged 42 years. Also his daughter Mary Sommerville who died 30th May 1925 aged 81 years. Also his daughter in law Mary CAMPBELL died 29th Jan 1946 aged 83. GC, “Kirkyard gravestone 4,” Carsphairn Archive, accessed April 24, 2019, http://carsphairn.org/CarsphairnArchive/items/show/110.